Since this is only my third homage and I am talking about films again, one can see how much I adore the cinema. I love this time of year because there are many fine films that start coming out across our fine cinemas. It is the time of Oscar (not that the Winter months are the only times great films arrive, but there are traditionally a slew of them at this particular season). Going to see a film for me is spiritual in nature. I love EVERYTHING about it: purchasing the ticket, buying the gross food (although I wish that it were less expensive), and seeing the trailers: the new stories I will soon get to see and adore adding to my long list of favourites, and then (of course) the main event itself: my cinema story of wonder. And I get to experience it with strangers, people that share only this tale as their common thread. I really think the whole thing is beautiful, I do. On Christmas, I am viewing "Sherlock Holmes" with my Mama, Terry, Bran, Dee, and possibly Brie and her cohorts. I cannot wait to see the film and love the Christmas tradition of seeing a film with family. Usually it is just Mom and me (and Dad when he was with us, now it is Terry)... adding more to the pack is FUN to me. Many a great film has been seen on this day: "Cold Mountain", "The Family Stone", "Enchanted" to name a few. I also love that there are an overwhelming amount of trailers out at this time. Maybe there are always this many, but it seems that there are more shown now. I just saw one that made me have to change my britches it was so fantastic. 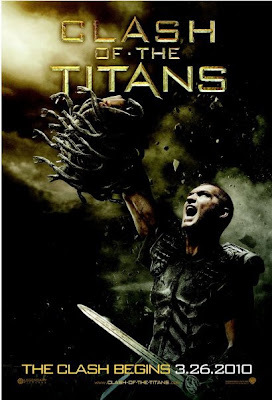 "Clash of the Titans" was a film I loved and so did my brothers. Now with the advancement in technology, this remake looks like a spectacular event. It is a phenomenal trailer and I HAVE TO SEE THIS. I love the trailers, love 'em, always will. Take a moment and look at this beauty of what looks to be a great film!